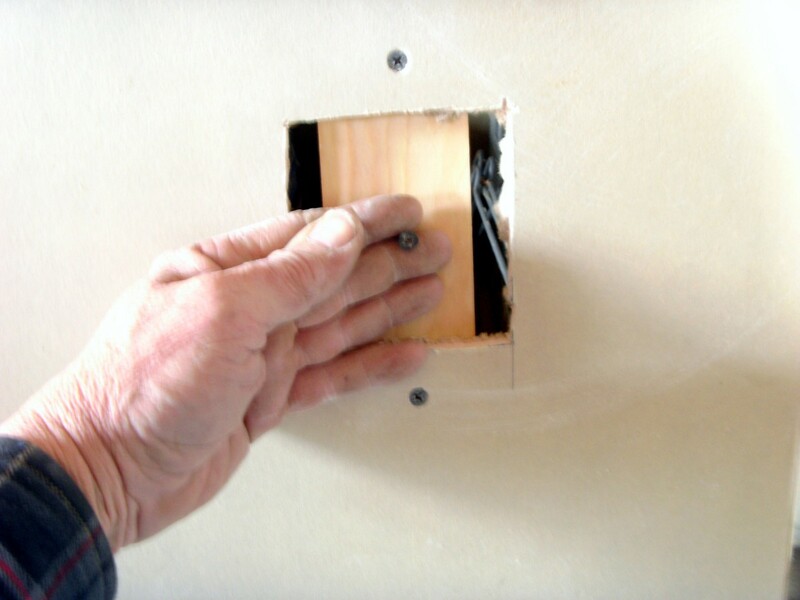 Patching and repairing holes in drywall is something nearly every homeowner will face sometime. While drywall (sheetrock is a trade name) is a wonderful wall covering, giving quick installation and cheap cost, it is not the most durable covering around. 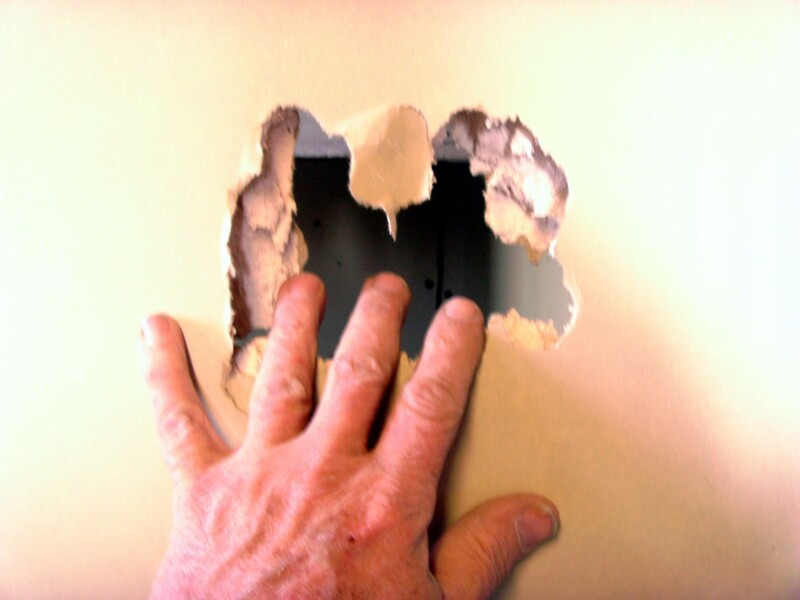 At the same time, however, repairing sheetrock is not difficult, Patching even the largest holes in drywall is within the abilities of nearly every homeowner, is not expensive to do and does not require a large inventory of tools or materials. 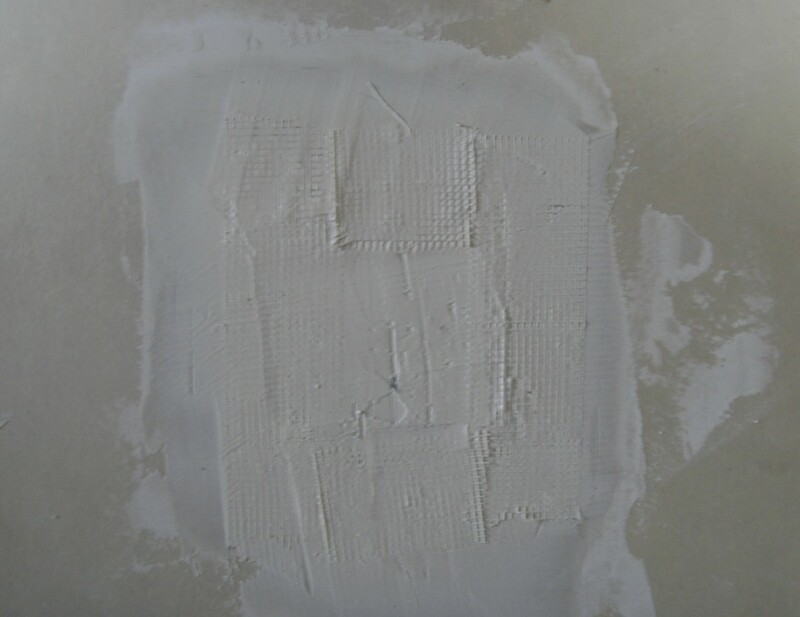 In general, patching holes in drywall can be divided into three separate categories; small holes around 1 inch in size or smaller, medium size holes up to 8 or 10 inches and large holes. Each is treated somewhat differently and will be addressed separately. 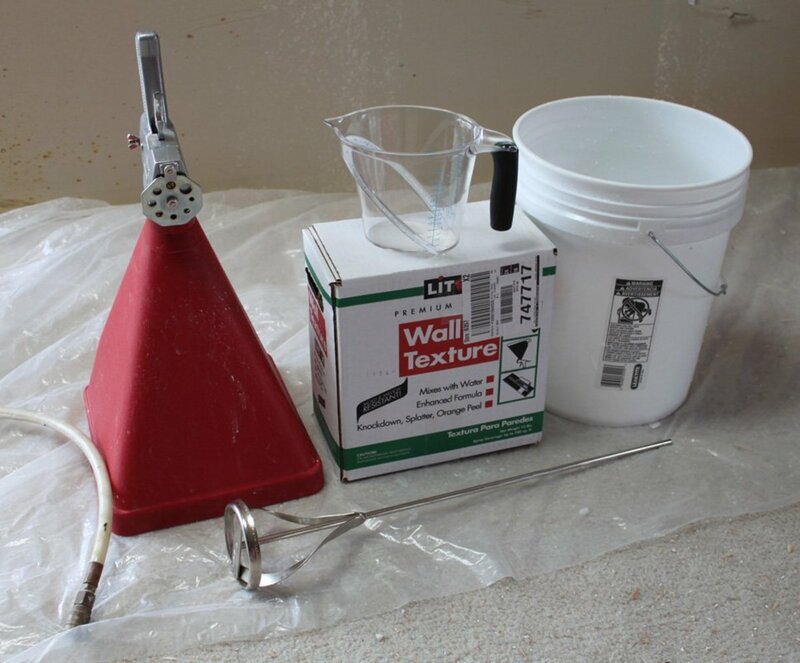 Pictured above are common tools used for patching holes in drywall. The small holes will not require the cordless drill, nor will they need the rock saw. Often it is more convenient to simply purchase a small patching kit instead of buying a roll of drywall tape, a drywall knife, and drywall mud; several such kits are featured here. The rock saw pictured makes quick work of cutting drywall, but a razor knife will do the job with a little more effort. The cordless drill pictured is used to drive screws in the patching of larger holes; a screwdriver will work but will again require more effort to complete the work. 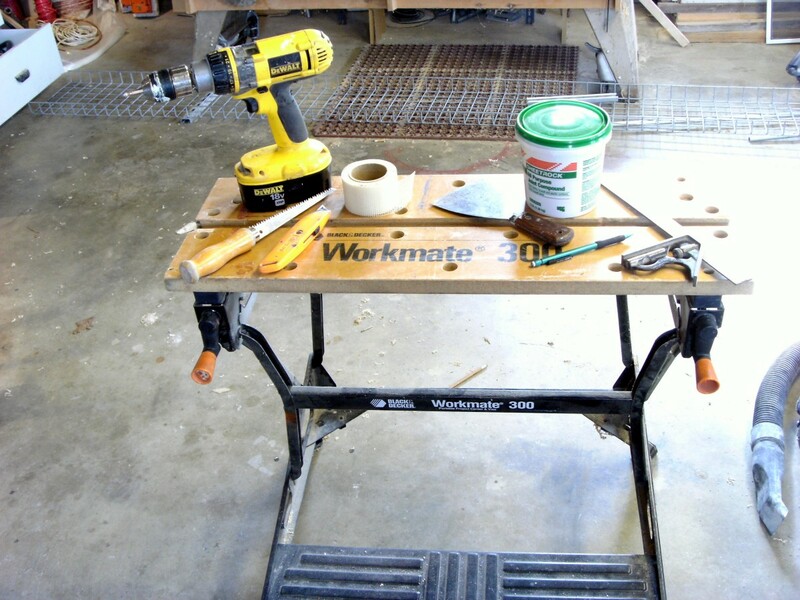 The folding Black and Decker workmate bench is not required; it is only used as a prop for taking the photo. While it makes a nice addition to your workshop, it won't be used to patch drywall. Some type of drywall knife or putty knife will be necessary. Some patching kits come with a small plastic knife that, while serviceable for small jobs, is not ideal. Preferable is a 4" or 6" drywall knife, with preference given to the 6" size. While you will not be finishing an entire wall of drywall, using the smaller 4" size makes it difficult to smooth the drywall mud of larger areas. Drywall tape will be used for all but the smallest holes, with the mesh type being preferred for small holes. 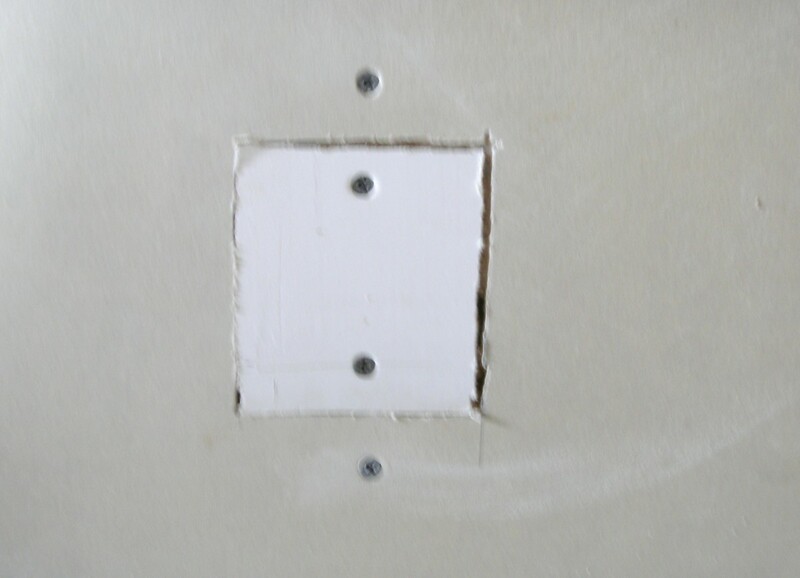 Paper tape is quite adequate for patching larger holes in your drywall. 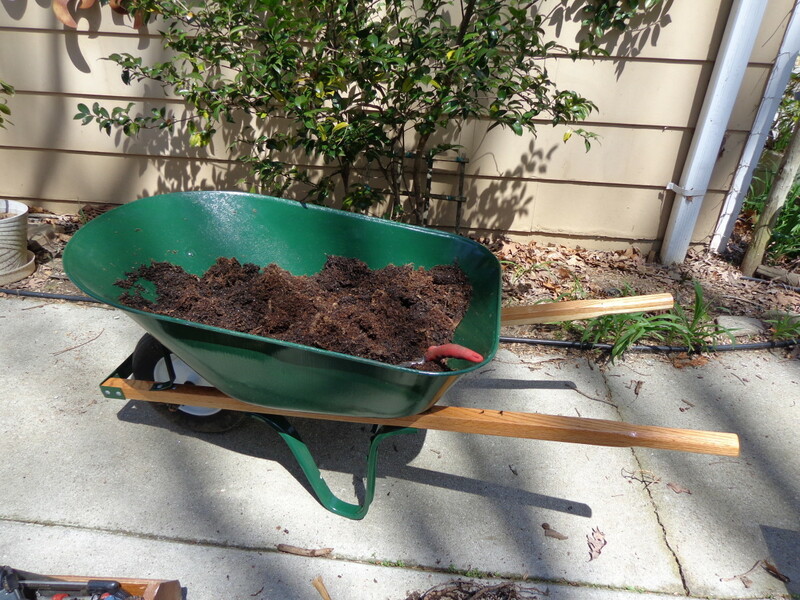 A small amount if drywall mud will be needed; this can be purchased in 3-pound tubs or even smaller sizes. It will not last forever, even in the can, so don't buy far more than is needed. 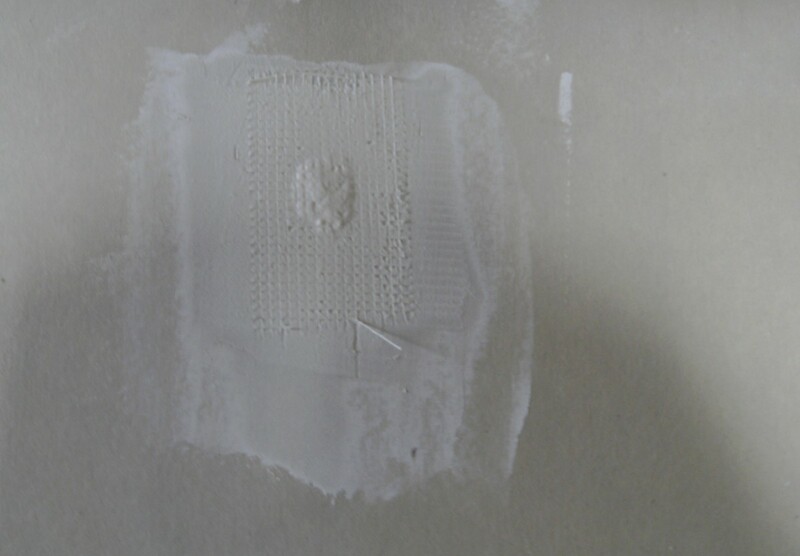 Any drywall patch can be done with the 3-pound size. 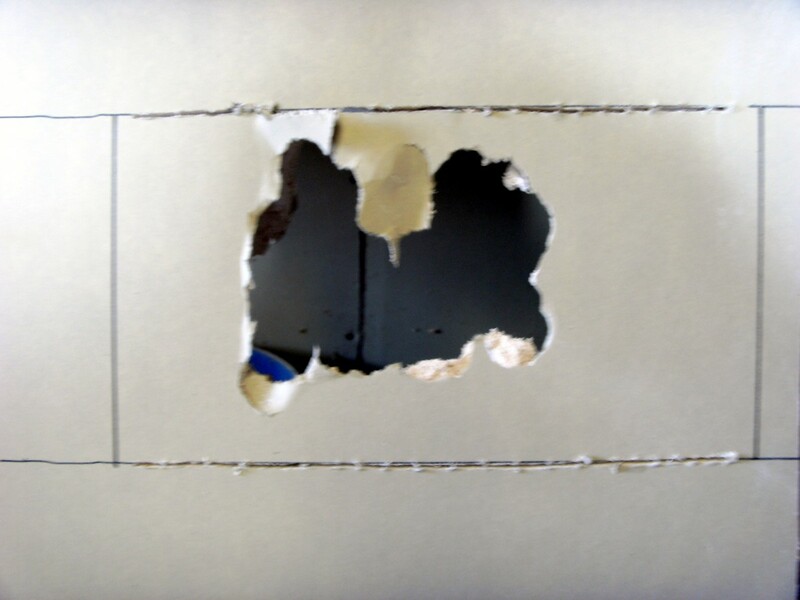 Repairing small areas of sheetrock damage is by far the easiest and simplest task. 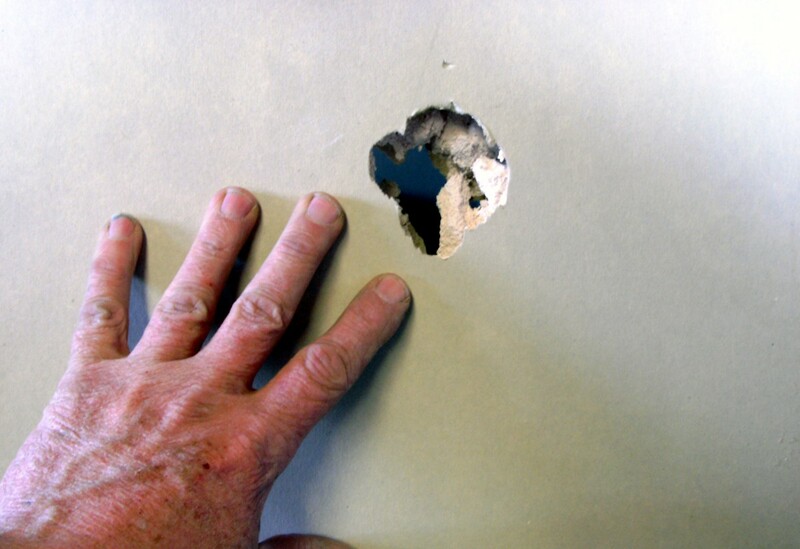 Small holes are categorized as those damaged areas of around 1" in size: if it is much bigger than your thumb, you should probably check out the next section. At the top of this list are those holes made by nails or other similar very small holes. These can be patched with nothing more than a daub of drywall mud or even toothpaste on the tip of your finger; simply push it into the hole and smooth it out. 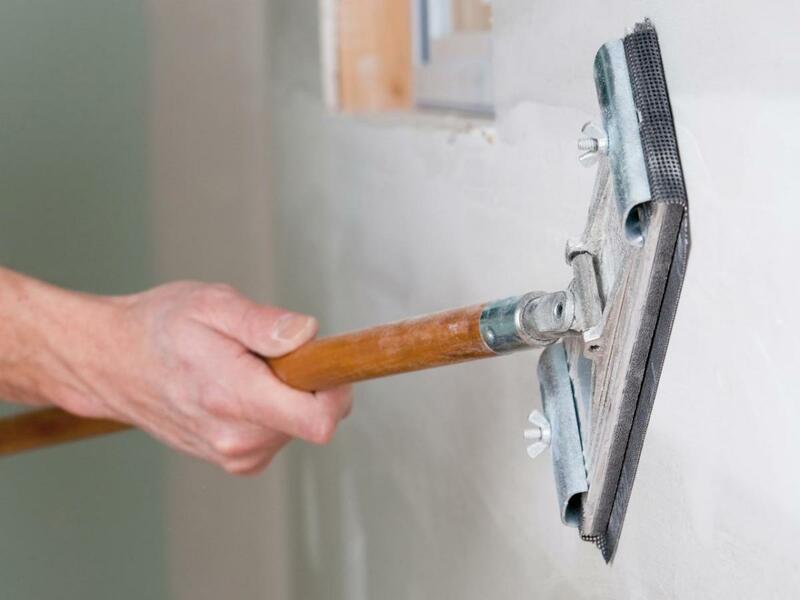 Excess drywall mud can be removed with a damp sponge after drying or by sanding. A larger hole, up to about 1", can be repaired with just a little effort. Clean the hole out with a razor knife, sloping the sides so that the outside of the hole is slightly larger than it is on the inside of the wall. 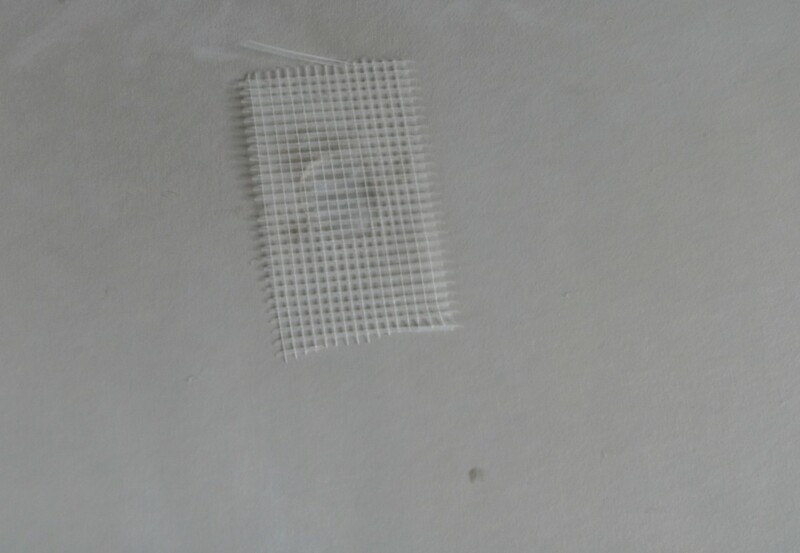 Using mesh drywall tape or the patches supplied with a drywall repair kit stick the patch over the hole. 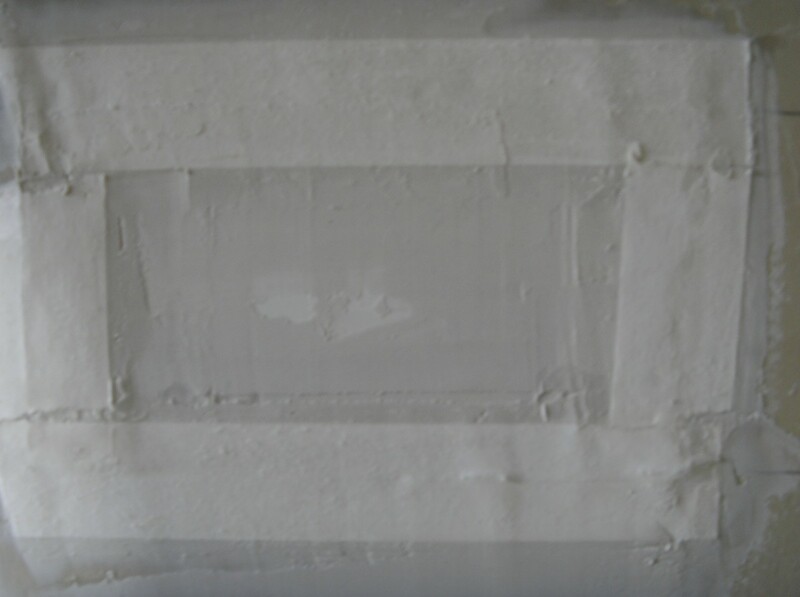 Cover the mesh patch with drywall mud, pressing it firmly onto the patch and into the hole with the drywall knife. This should be a fairly thin coat of mud, leaving the mesh tape visible. Feather the edges out to nothing about 2 or 3 inches from the patch. Try not to leave any ridges or bumps of mud, but if you do, they can be sanded off quite easily. Let dry: some types of mud will dry in only a couple of hours while others will take 24 hours. Check the instructions on your mud. Sand the patch lightly, being careful not to push hard on the hole. Apply a second coat of mud over the entire area, extending it out to around 4" outside the hole all around. Let dry once more and sand again. If the wall is smooth, be aware that any imperfection will be visible on the painted wall. If any can be found, repeat the mudding process for a third and final time. 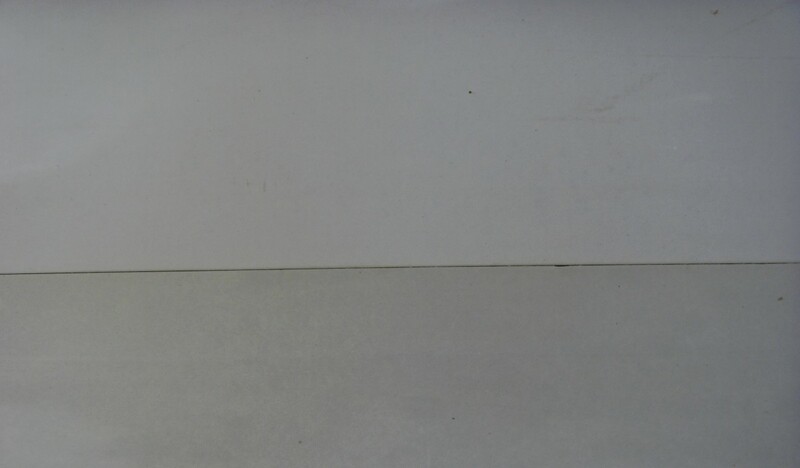 If the wall is textured, wall texture may be purchased in different texture appearances and simply sprayed on the wall. 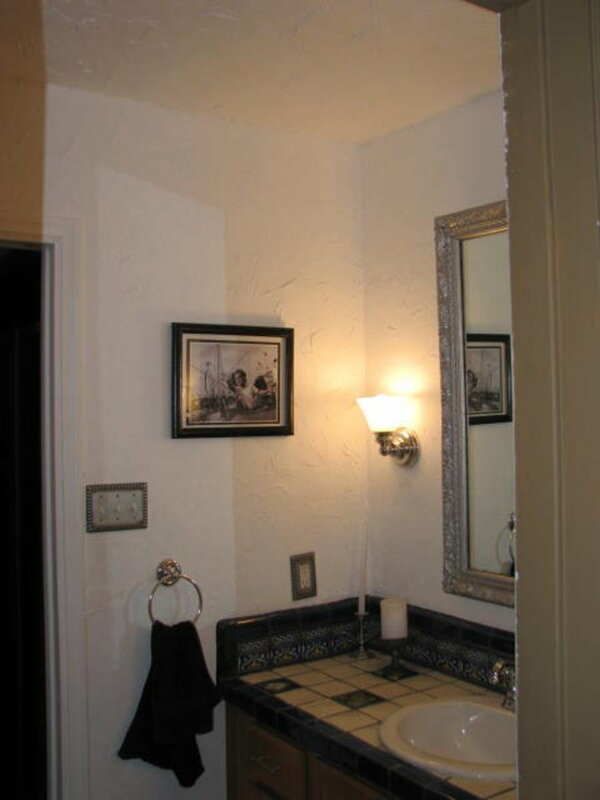 When dry, paint to match the surrounding area. 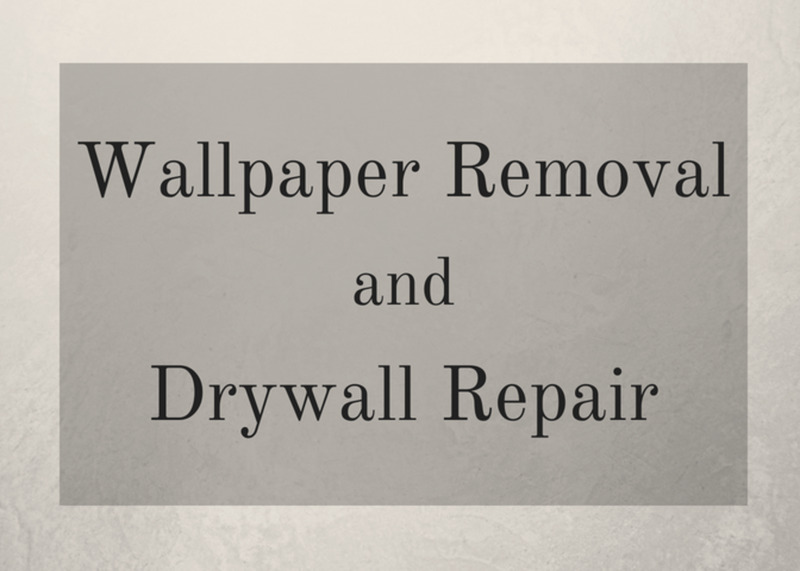 If you are painting the entire wall, this is a great time to patch all of the small (and larger) holes in your drywall as it will greatly enhance the finished wall. This type of patch is quite weak and easy to damage again. For that reason, only small areas are normally patched in this manner. 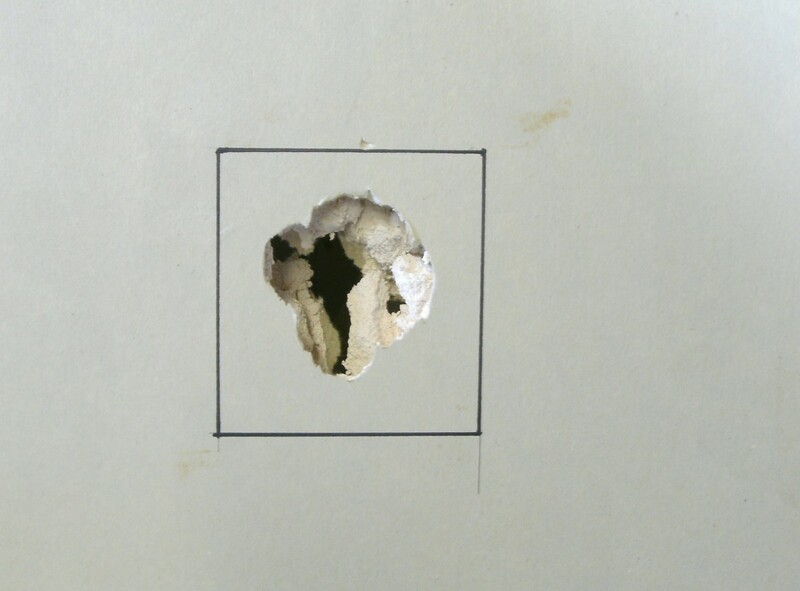 Some kits advertise that holes up to several inches across may be repaired, but it is not recommended unless the damaged area is high on the wall or in some other way relatively inaccessible. Next in line are the mid-sized holes, ranging from around 1" to about 10" in diameter. It is obviously impossible to simply fill a hole 10" across with mud, so a different method is necessary. Some form of backing to hold the mud in place is required. 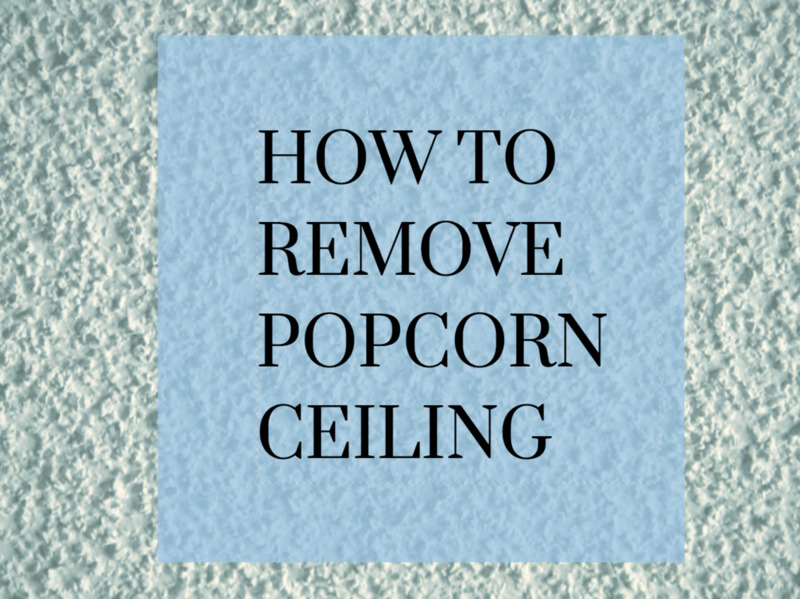 The simplest method here, and probably the one most used, is to provide a wooden backing behind the hole and cover that backing with new sheetrock. Start by drawing a square around the hole, completely enclosing it. In the below, a magic marker was used as it shows up better in the photo, but don't do this! A magic marker may well bleed through the mud and paint, showing through the finished job. Use a pencil. Cut out the square you have drawn using a rock saw or utility (razor) knife. The rock saw is quicker and easier, but utility knife more common; either will work fine. 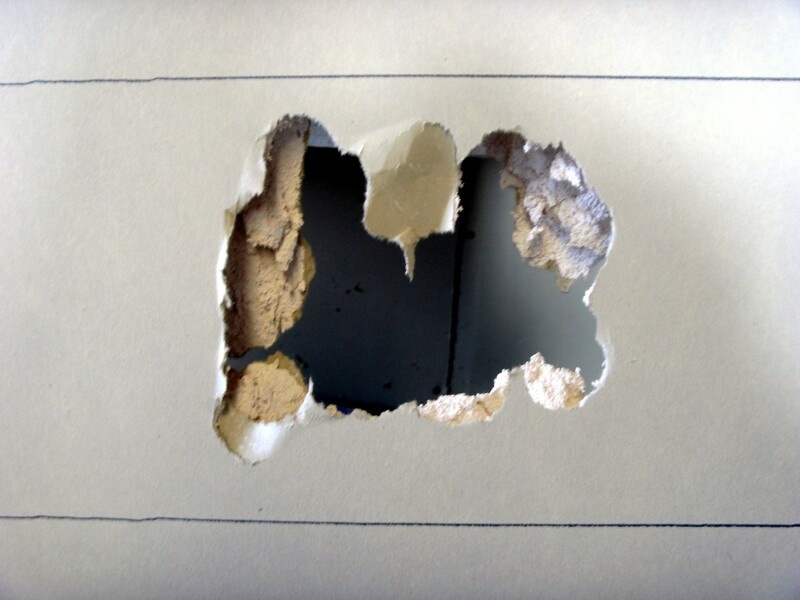 It is best if the hole is perfectly square (using a carpenters square will help) as a patch must now be cut from some scrap drywall, sized to just fit into the hole. 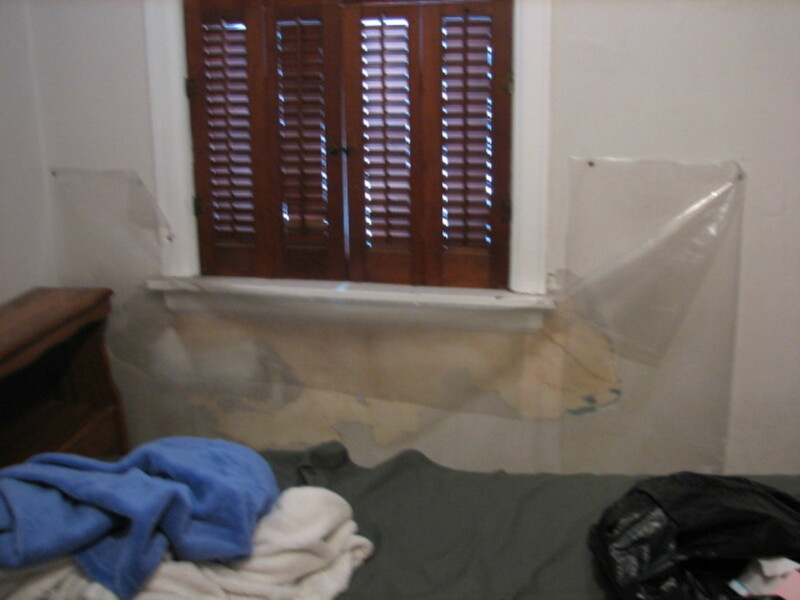 Make sure the patch is the same thickness as the drywall on the wall being repaired; most homes use ½" drywall. You will need a small piece of board, a little narrower than the hole and about 4" taller. The photo below shows the board to be used; a screw was driven into the center of the board to use as a handle. 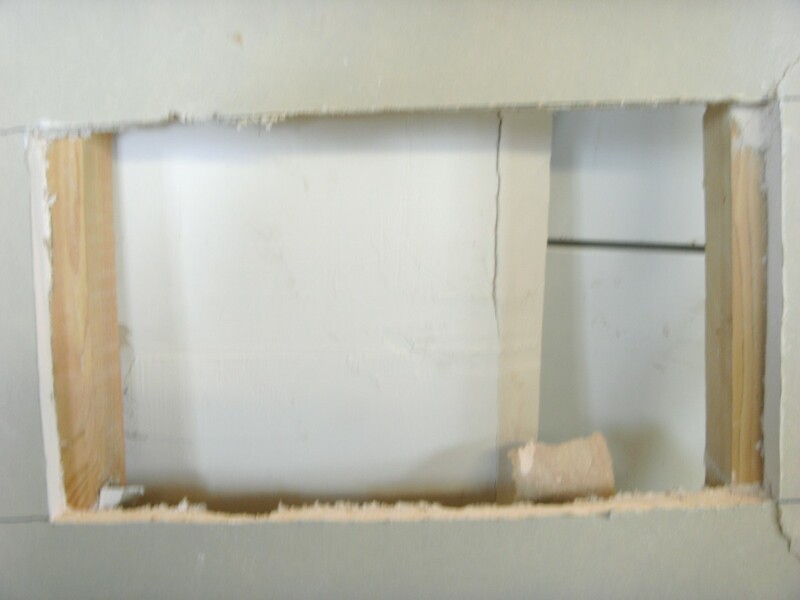 Insert the board into the square hole you have cut into the wall and drive a screw through the remaining drywall into the board above and below the cut opening. Larger openings should have 2 screws both above and below. The "handle" may now be removed from the board. Larger holes in the 8 or 10-inch size should have two boards or one wider one. The patch is now inserted into the hole and screwed to the board behind it. Two screws are usually all that is required here unless the hole is large. Drive the screws in until they are just barely into the drywall; if the drywall knife is passed over them, you should not be able to detect where they are. The photo shows the correct placement. Drywall tape is now applied all the way around the patch, covering the seam between the patch and the existing wall. Either paper or mesh tape is fine here. When the taping mud is dry, apply a second coat. When the second coat has dried, sand lightly to smooth the surface (100 grit sandpaper works well) and apply a third coat as necessary. Finish the wall as desired, either with spray-on texture or left smooth, and paint. 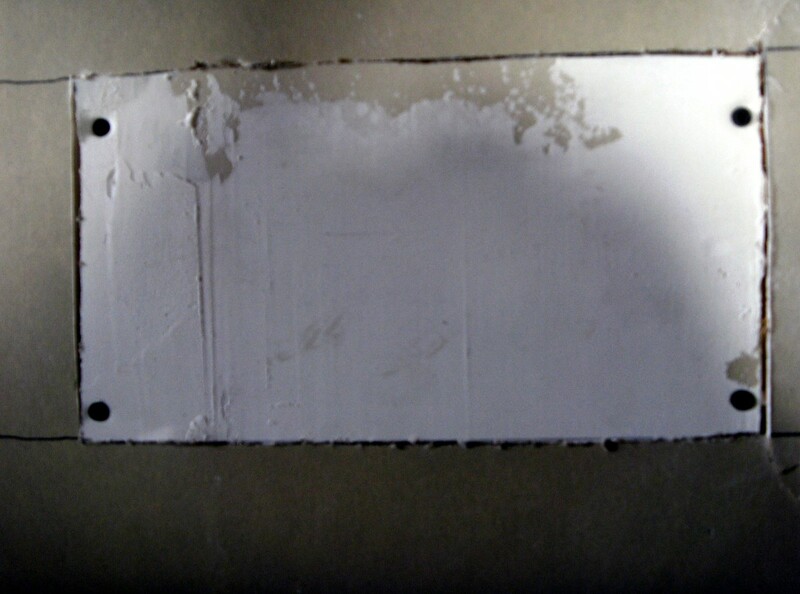 This patch is much stronger than the patch used for small holes in drywall and can be expected to last indefinitely. The largest holes, greater than around 12" in diameter, will require a different fix. 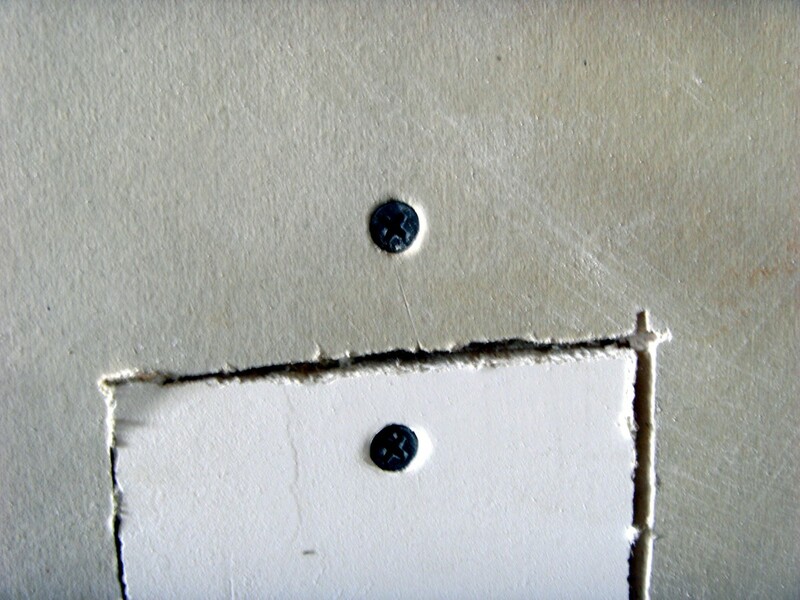 Patching a hole a foot across by using the existing drywall as a support will result in a patch that is all too easy to destroy again, the answer is to use the studding in the wall as support. Begin by drawing a horizontal line above and below the hole, preferably by using a level to get it actually horizontal. Begin cutting above the hole and cut towards the side until a stud is encountered. Stop there and cut the other direction until the studding on that size is found. As you will be cutting clear to the stud, be aware of any possible electrical or plumbing in the wall and cut carefully. Using the cuts as a guide, draw a line down each stud near the center of the stud. As studs are 1½" wide, measure ¾" from the end of each cut to find the center of the stud and draw a line between the two cuts. 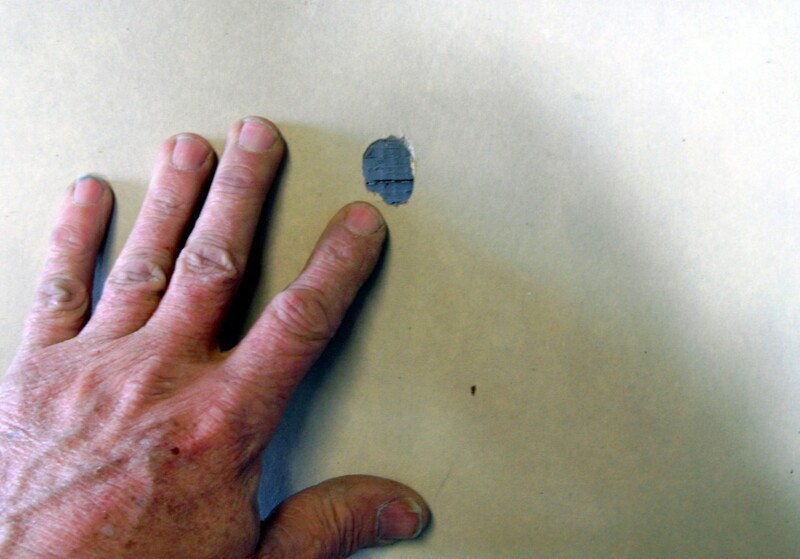 You will likely find a nail or screw when cutting down the stud; if so simply remove it. Cut down the center of the stud to make a large square hole that extends into the stud on each side. A utility knife works best here. 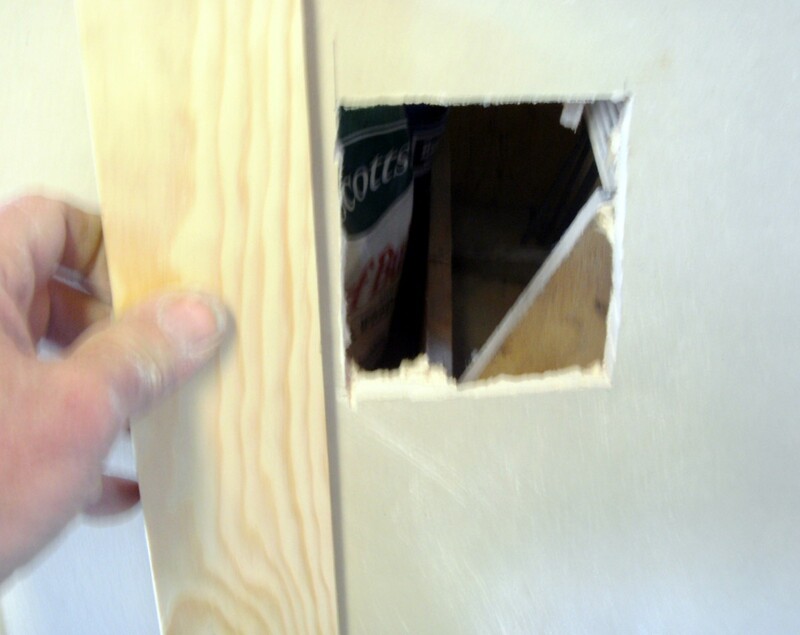 Cut a piece of scrap drywall just smaller than the hole so that it will fill the hole when set over the studs, and fasten it into place with either screws or nails. Drive either one just into the drywall; the idea is to have it just below the surface of the drywall without breaking the drywall paper. The section above shows a photo of properly driven screws. Tape and mud the seam all the way around. For instructions on how to tape a joint, refer to this hub on taping and finishing drywall. When the tape coat is dried, sand lightly and apply a second coat. When that coat is dried, sand again and apply a third, final, coat of mud as necessary. Sand as necessary. The wall may be left smooth or textured with the spray can wall texture featured above. Eventually, nearly everyone will have a hole or two that needs patching, and will have to learn how to do this minor repair. Glad you found the hub and photos useful, and appreciate the compliment. A very informative hub great photos I actually had a mobile home where I had to learn how to do this drywall patching. Thank You!